After being seriously ill 3 years ago I found Bioresonance. It was this therapy that discovered the bacteria that was affecting my skin. I was told by the NHS that I would be ill for 4 years yet within 6 months I was well again. Once I recovered I decided to train as a therapist and help other people discover the benefit of Bioresonance. 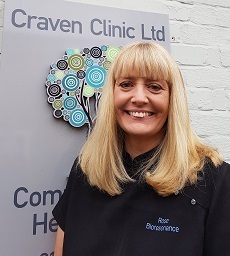 Fully trained by the German Bioresonance Institute, I'm delighted to be joining the team at Craven Clinic and I also work from my home in Eastby near Skipton. If there are aspects of Bioresonance Therapy that you want to discuss, then please contact me directly by the details below or via the Craven Clinic. Sessions are normally 60-90 minutes long and cost £75 per session.